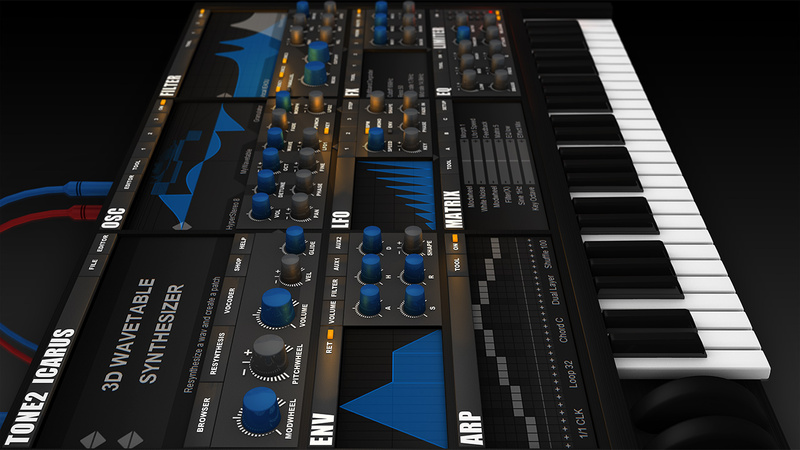 Tone2 Icarus for Windows and Max OS X is a powerful synthesizer with '3D wavetable synthesis'. It offers a fresh signature sound, which quickly catches the audiences' attention. An easy to use interface and a over 1000 factory sounds created by professional designers allow a rapid creation of professional tracks. What's new with '3D wavetable synthesis'? 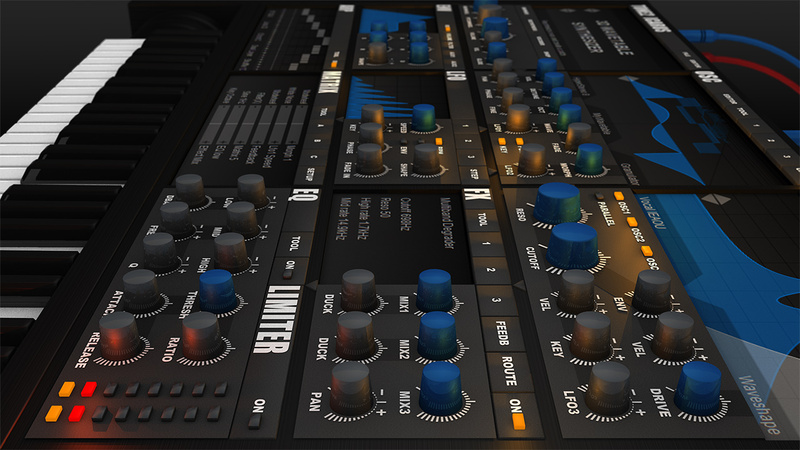 Icarus is a '3D wavetable synth', because we extended the popular traditional wavetable synthesis, which allows to cross-blend waveforms, with an additional dimension for morphing. 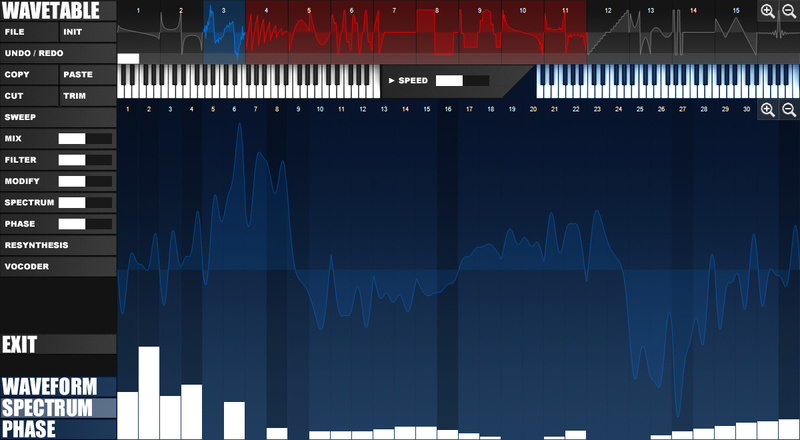 Icarus can create special sounds with lots of dynamic expression and movement. Most of these sounds are hard, or impossible to create with other synthesizers. 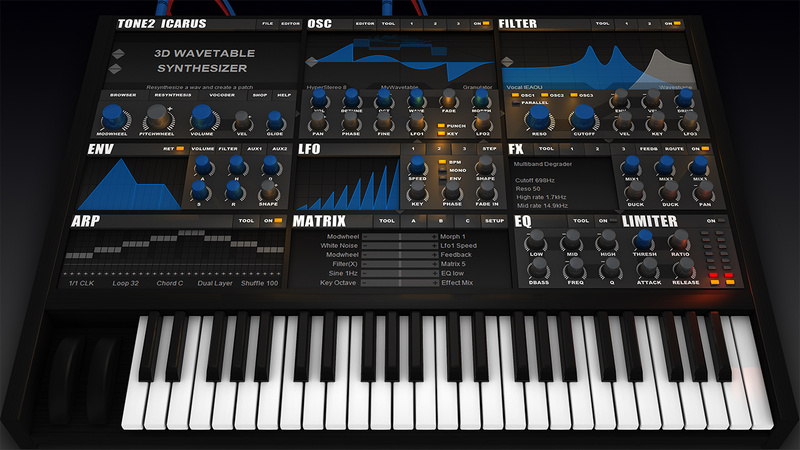 This synthesizer can do: All classic synthesis methods, 3D wavetables, morphing, resynthesis of samples... It has: 53 effects, 3x10 stereo oscillators with hypersaw, dual stereo filters with 62 filter types and distortion, an arpeggiator, a vocoder, a wavetable editor. 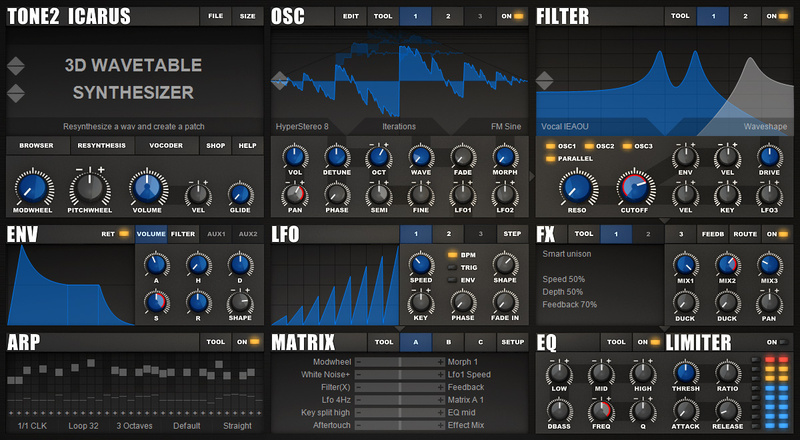 Wavetables can be morphed with 54 different modes (FM, PWM, formant, phase distort, sync, ...). Supported platforms: Max OS X 10.5 or higher, Windows XP, Vista, 7, 8, 8.1, 10. 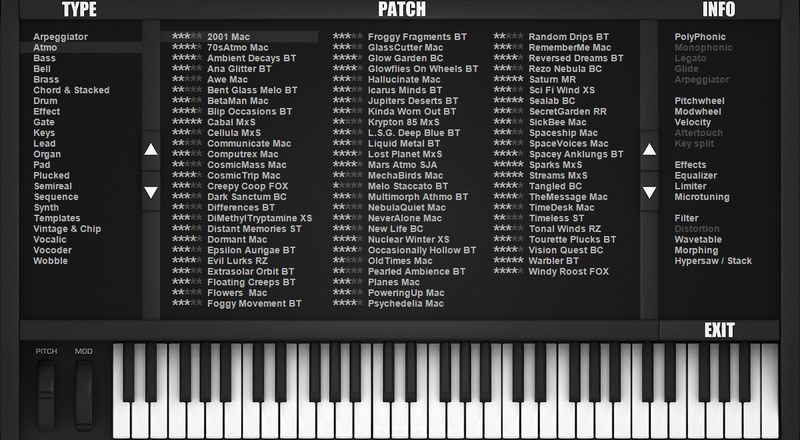 Supported plugin formats: 32-bit VSTi, 64-bit VSTi, 32-bit AU, 64-bit AU, Standalone for PC. Excellent resynthesis (importing samples and creating wavetables). Low CPU usage. This is my favorite wavetable synth (with Serum being close second). Icarus is Tone2's magnum opus. If you are familiar with the company, you will know that there's a particular "quality" to their synths: a fairly digital sound, a fairly scratchy reverb, a feeling of "technical excellence" at the expense, perhaps, of refinement. Those qualities are still here in Icarus, but they seem to have "owned" that, more or less, and produced something that really stands out. Icarus has a striking *clarity* to its sound, a snappiness to its envelopes, and an elegance to its workflow that is quite compelling. If there is a standout negative to this, it is that Icarus more or less makes the rest of their synths superfluous. My first Tone2 synth was Gladiator, and I loved it. ...Then along came ElextraX, and I felt I no longer needed Gladiator to get the same kind of sound, so I stopped using it. ...In fact, ElectraX was so much easier to use and such a capable synth, that even after extensive demos of their other synths (notably their FM and "transwave" synths), I felt their was too much overlap in the sound to warrant another purchase. And again, when Icarus was released, I listened to the demos and thought "meh: this is just a reskinning of ElectraX." Tone2 has really outdone Serum in terms of wavetable manipulation: every feature here is a delight, from the drawing tools to the randomize function: you will end up with very pleasing results with MUCH less work. They are really to be lauded here. The resynthesis is always great fun to play with and can result in your own very distinct patches. The mod-matrix here meets all the modern requirements: drag-and-drop but *also* right-click assign, and *also* directly editable. Assignments are graphically displayed along with their depth and can be modified right from the affected knob. A good number of envelopes (4), a good number of LFOS (4), surprising number of waveshapes for the LFOs, the arp can be used as a mod source, and one mod slot can affect the depth of another. (This is actually less powerful than a matrix with built-in depth modifiers, but it'll do—it is at least clear, here.) A good number of slots—I haven't found myself wanting for more, yet (though, eventually, I'm sure I will. I always do). The filters are really amazing here: there are SO MANY of them, and the "typical" ones are very high-quality and the "creative" ones are a lot of fun. The drive is not the highest-quality, but it's available and it does contribute to the quality of the sound. The display is also highly appreciated: while it's not *attractive*, it's actually one of the most useful graphical representations of a filter I've seen: very fast and very detailed. You really feel like you can see *exactly* what the filter is doing. I'm not personally a big fan of Tone2's effects, so I largely skip this section. They "work," but the controls are a bit weird (rather than knobs, you "drag" text values). There is, as Aiyn Zahev said (of another synth) "a cheeky duck knob" to the effects, though, and that's nice for when you want THAT sound. The EQ and limiter of limited (har har) quality, but, again, they add to the sound. 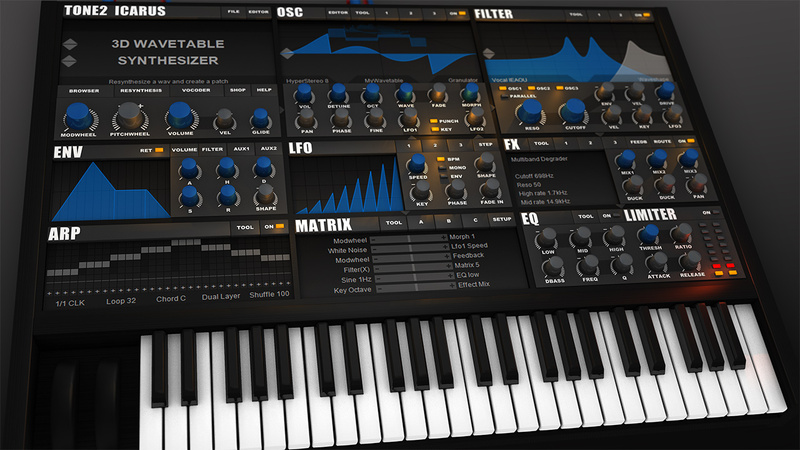 Really, the "stand out qualities" to this synth have to be the wavetable oscillators (PARTICULARLY the editor), the diverse filters, and the *cracking* all-on-one-page workflow. Icarus is one of those synths that doesn't quite scream "we are aiming squarely at synth X." If it did, I would have to say it was aiming at Serum. ...which would be a shame, because I think, ultimately, Serum is a superior overall synth. That having been said, personally I actually find Icarus a more *usable* synth. It's more immediately creative, it's a bit broader in sound and usability. ...I've never really gotten a *truly* satisfying pad out of Serum, for example: that's just not its strength. ...Icarus handles them with aplomb. For me, Icarus is more of a stand-in for an Access Virus or a Blofeld or the like: a decent VA, albeit on the digital side, with that "wavetabley" sound that excels at pads and plucks. I don't care about making dubstep basses, so don't ask me if it's good for that. ...I doubt it could touch Serum for that sound, though. [shrug] I am finding this difficult to express, but: I reach for Icarus more often than Serum. Serum, for me, is something *specific, * for cutting, standout sounds. It screams "here I am!" regardless of how you use it. Icarus is more of a broad tool that handles almost everything very well, AND it is best-in-class for wavetable editing, hands-down. All of that said, Icarus, today, is certainly one of my top-ten VSTs, right up there with Serum, Avenger, Omnisphere, Strobe, Diva, RePro, and LuSH. For me, I would probably even put it in my top five. Perhaps I cannot *quite* tell you why. ...it's probably because I *love* wavetables. :) When it comes down to it, if you are a studio-minimalist (or just don't have the money for overlap), Icarus is a hard sell. You'll probably want either Serum or Avenger. But if you just love sound-design and can handle having another creative synth in your arsenal, you would be remiss to pass over Icarus. It is really something very special. A final note: I am aware that there is a group of users on KVR who feel it is their duty to downvote all "overly-positive" reviews. Conceptually, I understand their motivation: to account for some of the "hype" that surrounds synths and to point out that "things can always get better." So be it; I am powerless to stop them. I do, however, have a message for them: you are idiots; get over yourselves.